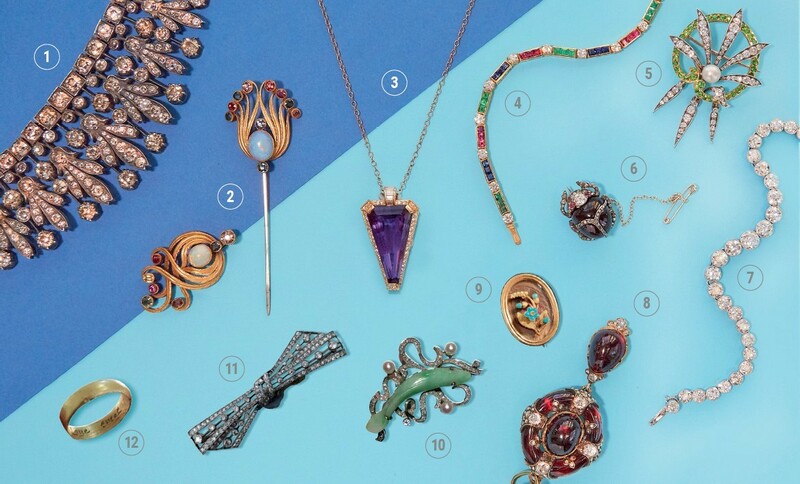 A selection of 12 pieces of jewellery from seven dealers at Grays and Alfies antiques markets. Pictured above is a selection of items offered by some of the Grays' long-standing dealers as well as a couple from sister centre Alfies Antique Market on Church Street in NW8. 1. A diamond necklace/tiara in 14ct rose gold and silver set with 494 old-cut diamonds, POA from Robin Haydock. 2. A French Art Nouveau multi-gem jabot brooch c.1900, £4950 from John Joseph. 3. An amethyst & diamond pendant c.1984, £1950 from DB Gems. 4. An 18ct gold emerald, diamond, ruby and sapphire bracelet c.1960, £4200 from DB Gems. 5. A Victorian diamond, green garnet and pearl brooch c.1800, £4950 from John Joseph. 6. A Victorian cabochon garnet scarab beetle c.1860, £4500 from DB Gems. 7. A diamond bracelet set in platinum c.1910, approx. 12 carats, £16,500 from John Joseph. 8. A Victorian gold, diamond and garnet Holbeinesque pendant, £8950 from John Joseph. 9. A gold, turquoise and hairwork forget-me-not brooch, £895 from Nigel Norman. 10. A jade, diaomond and pearl carp brooch, £1900 from Gareth Brooks at Alfies. 11. A Belle Epoque diamond ribbon brooch, £1200 at Kieron Reilly at Alfies. 12. English posy ring engraved Love Equals c.1680, £2000 from Peter Szuhay.